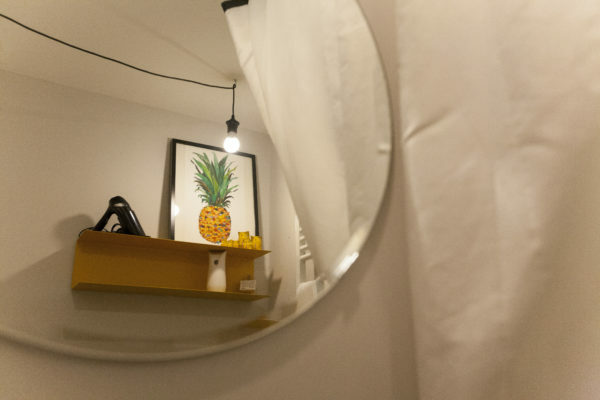 The “Pineapple “is our Standard Room, modern and fun! Overlooking the pretty courtyard, this rooms offers a quieter, relaxed setting. Instantly your attention is immediately drawn to the high ceilings. The use of diffused lighting works well with the neutral colour of the décor and crisp bamboo wooden flooring making you want to kick off your shoes, and make yourself comfy as if you were at home! This standard room offers an En-suite bathroom with complimentary shower gels and shampoo, helping you wind down after a long, exhilarating day taking in the beautiful sites that Rome has to offer. The building dating back to the 800’s benefits from extremely thick walls guaranteeing a constant pleasant climate temperature. In the winter season, in the colder months we provide you with comfortable warm duvet covers. For your added comfort you will also find a docking station in which you can connect your smartphone. Wireless internet is available throughout. You can also maximise your connection speed on your laptop with the use of an Ethernet cable supplied by us. WIFI access code will be given to you upon arrival. Breakfast is served in the kitchen between 7:30am and 10:30am. Just let us know what time suits you and your preferences underlining your choice on the ticket we give you at check-in, and we will do the rest. Check-in is from 14:00 Check-out strictly by 11:00am. We offer the chance to deposit your luggages here on the last day, there are no extra charges.